Everything was perfect!!! Great views, great staff and an amazing breakfast. Location was excellent! Great view from private terrace. Had our own infinite pool and outside hot tube. Location is additionally great as you aren’t around the large crowds of Oia. Additionally, there are some good restaurants in proximity. Breakfast was included and was excellent! Staff was amazing!! Breakfast was delicious. Hotel is close to Fira and Oia. The Fovois Suite is phenomenal with breathtaking views. Perfect vacation! Staff were amazing to deal with, they even helped us order lunch to be delivered to the room. Great breakfast options. The room was throughly cleaned everyday. A luxurious hotel well worth the money. I like the location, the decoration, the staff were very friendly, the view from my Armonia villa is a very very fabulous. The breakfast under your choices. The reception can arrange everything you want, Taxis, book at restaurant, tours, and even ordering food from any restaurant you want. EVERYTHING, from start till end. 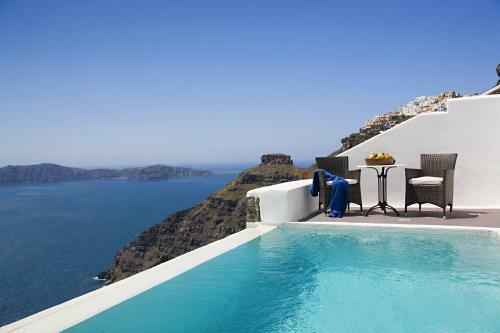 Probably the best hotel ever in Greece or even Europe!!!!! Staff was polite and helpful, breakfast was GREAT, the view... I would love another night here but they are FULLY BOOKED!!!!! I will come back to Santorini just for the sake of staying here. Missing this night already! The staff were so friendly and helpful. The hotel was very beautiful and the candle night dinner was splendid. We had a great stay. It is highly recommended. Lock in a great price for Dreams Luxury Suites – rated 9.4 by recent guests! 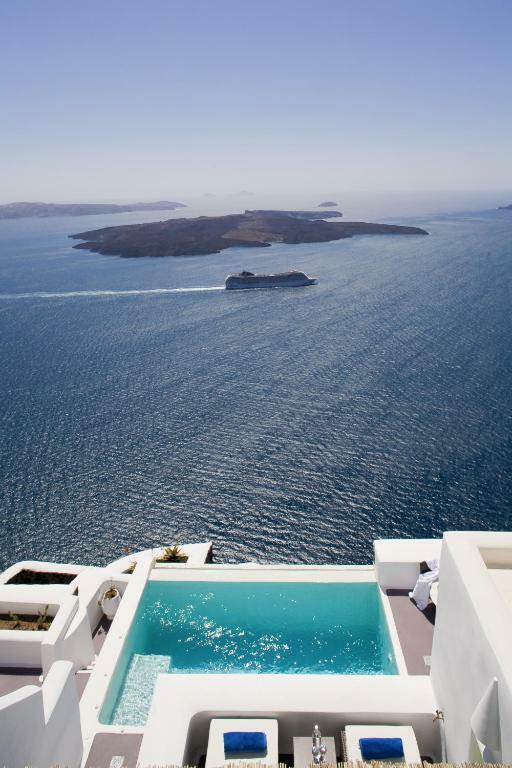 At the highest point of the Caldera, Dreams Luxury Suites offer a combination of privacy, elegance and breathtaking views overlooking Santorini, the Aegean Sea and the beautiful sunset. These unique accommodations include just 4 suites, originally built more than 100 years ago. Recently renovated, they have kept their traditional style and charm, while featuring modern and luxurious amenities. 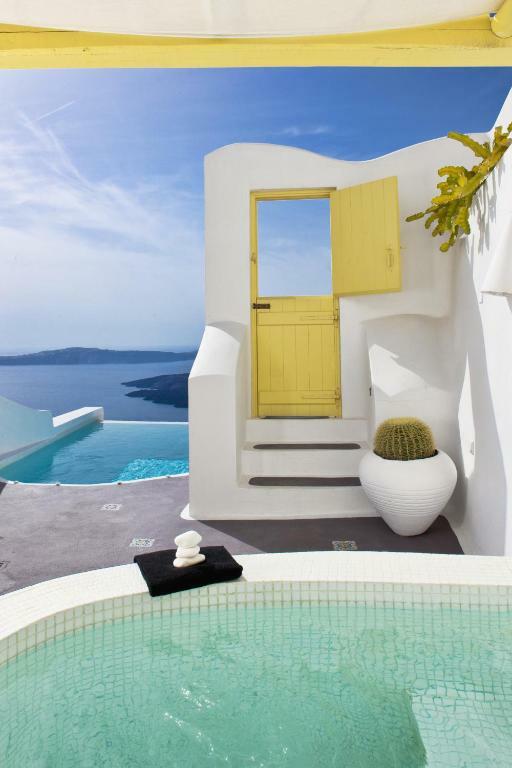 Each suite is designed in the Cycladic style and includes its own private terrace, complete with a swimming pool or hot tub, overlooking the stunning Caldera and Aegean Sea. The small number of suites ensures a high quality of service and privacy. 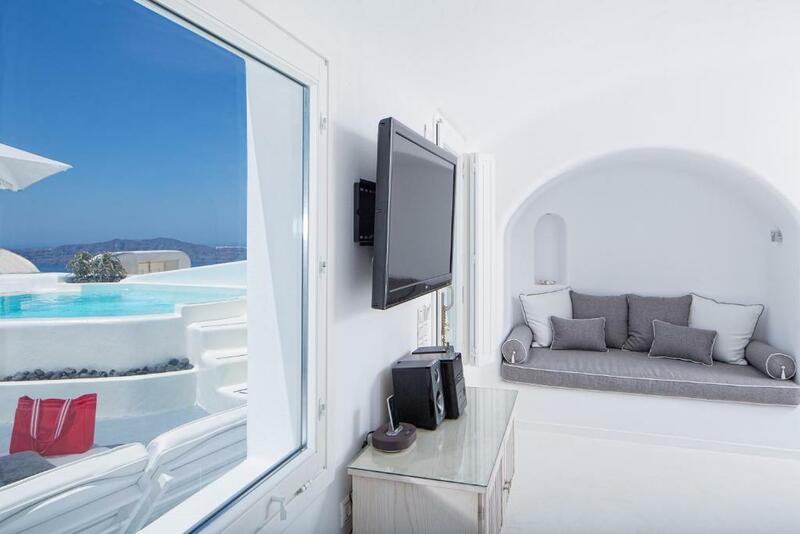 뀐 Located in the top-rated area in Imerovigli, this property has an excellent location score of 9.3! When would you like to stay at Dreams Luxury Suites? 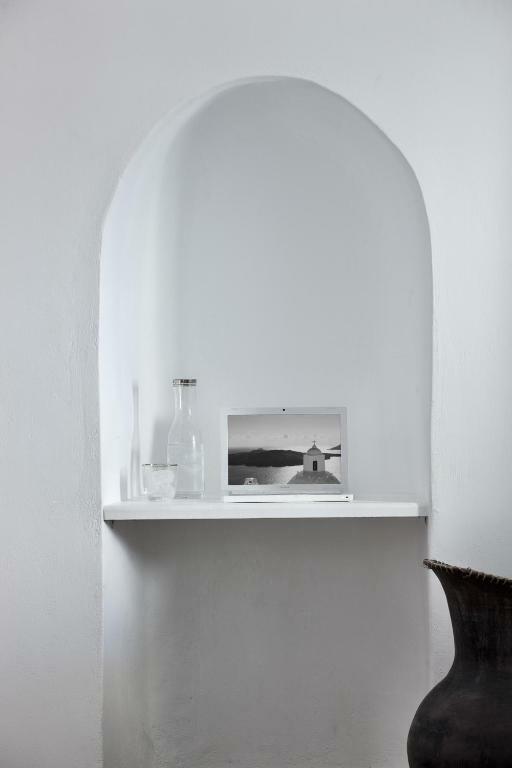 Decorated in Aegean hues, this suite includes a panoramic patio with an outdoor heated hot tub overlooking the sea, just for 2. Romantically lit by lanterns, it is the ideal place to sip a glass of chilled sparkling wine and watch the sunset. Nefeli houses a domed living room with a built-in sofa bed, full kitchen and a bedroom with a queen bed. The spacious bathroom features jeweled tones of blue accented by gold. It is 590 ft² and can accommodate up to 3 people. This suite is a paradise consisting of a plush living room with 2 built-in sofa beds, a bedroom suite with a king bed and a fully-equipped kitchen. Treat yourself by enjoying the hydro massage corner of your own private swimming pool situated on the exquisite terrace. Complete the day by relaxing in the mosaic tub in the impressively large candle-lit bathroom as you draw a scented bath. Your mind can relax as you sit on your terrace taking in the panoramic view, with the kaleidoscope of sunset colors reflecting off the caldera and the Aegean Sea. It includes 753 ft² and can accommodate up to 4 people. True to its name, this suite is where luxury and comfort live in perfect harmony. Relax outdoors in the shade or the sun, or listen to music in the fully-equipped plush living room. Cool off in your private swimming pool with its water jets and enjoy the view of the caldera, sea, and spectacular sunset. The suite houses a bedroom with a queen-size extra sofa bed, kitchen and a cave bathroom decorated in the colors of the sea. It is 700 ft² and can accommodate up to 3 people. This suite is the essence of luxury with its seemingly infinite private swimming pool equipped with hydro massage jets. Relax in the sun on the plush lounge chairs by day or on the candle-lit terrace of Foivos at dusk. The pool is embedded into a terrace overlooking the historic remnants of the ancient volcano, surrounded by the deep blue sea. 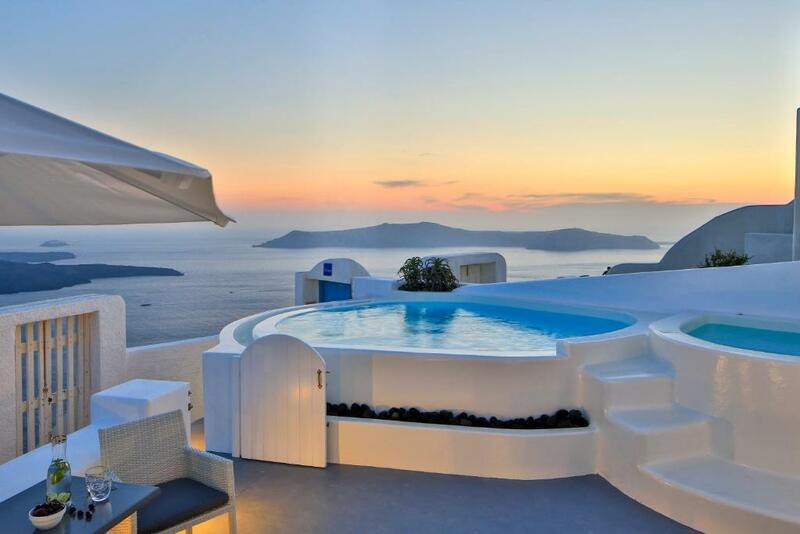 In the evening, this superb view becomes even more magnificent as it basks in the intense colors of the infamous Santorini sunset. There is a 1292 ft² living room. The amenities of Foivos are completed by a fully-equipped kitchen and 2 spacious bathrooms. One is decorated in Aegean blue and the other in golden red, reflecting the colors of the sunset at dusk. Enjoy the romance of the candle-lit alcove and relax in the essence of calm. This room can accommodate up to 5 people. Cave-style villa featuring Bauhaus-style furniture and light gray details. The bathroom is dressed with mosaic tiles and Venetian stucco, and has a large cabin with 2 rain showers. Tastefully decorated villa with indoor pool, hamam, private outdoor hot tub, an outdoor plunge pool and panoramic views of the sea. House Rules Dreams Luxury Suites takes special requests – add in the next step! Dreams Luxury Suites accepts these cards and reserves the right to temporarily hold an amount prior to arrival. Our room was really good but lighting to get ready needs a little improvement. The WiFi was quite slow and intermittent Room service menu is very limited on the choice of food offered Limited information on the fact that the hotel provides dinner only on days in advance booking (the website didn’t mention that this service existed so we assumed they would have a restaurant onsite as would any hotel which wasn’t the case) The jacuzzi, indoor swimming pool and outdoor swimming pool were only heated on the first day of our stay. The rest of the days the water was pretty cold and uncomfortable for us to be able to swim or use the jacuzzi on those breezy days. The temperature in these facilities didn’t change despite our complaint to the hotel manager so we only used the facilities for only one day of our stay. The TV versatility of international channels offered was disappointing, it was so basic it only had BBC, a Chinese channel and CNN. The rest of the channels were in Greek. We tried to use Netflix on the TV but on returning to the room after dinner to at least watch a movie and relax as the jacuzzi was cold, we found it had been disabled which made our last night a bit disappointing and frustrating. The prices a little bit high. The shower is too low, you need to pick it by your hand. And the most annoying thing is the salty water on shower and sink. That I didn’t have more days! And they are always fully booked! :( because I need more nights!!!!! 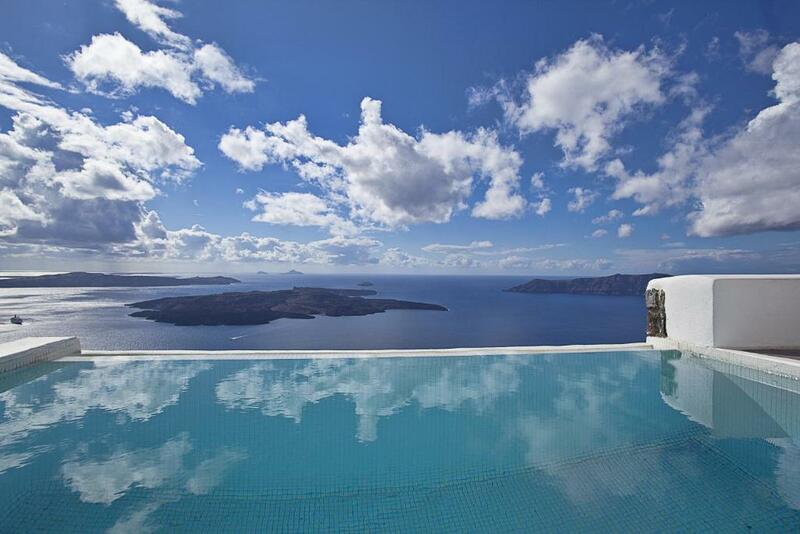 The infinity pool had a door and a lamp post in front of it which hindered the complete view. The service was excellent and the facilities were amazing.